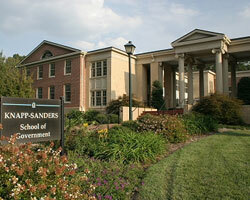 The School of Government is located in the Knapp-Sanders Building on the campus of the University of North Carolina at Chapel Hill. Founded in 1795 as the nation's first public university, the University of North Carolina at Chapel Hill enrolls more than 28,000 students in its undergraduate, graduate, and professional schools. Nestled in the rolling hills of the Piedmont, Chapel Hill is only minutes away from the renowned Research Triangle Park, North Carolina State University, Duke University, and Raleigh-Durham International Airport.